c. 500 AD: Commencement of first g'Kek colonization of planet Jijo. c. 2080: Earth united under The Bureaucracy. Humanity begins uplift of neo-chimpanzees, neo-dolphins. 221X: Human starship Vesarius encounters Tymbrini fleet in Cygnus (Contact). 22XX: One group from Earth begins Colonization of Jijo. c. 2400: Humanity and its client species neo-chimp begin settlement of planet Garth. c. 2470: Streaker encounters derelict fleet in a frontier area; Five Galaxies thrown into turmoil. ttani From this outline of the timeline, this story looks like science fiction from the 40s, like E. E. Smith. If you had to explain in a word how the Uplift series would be 80s SF, what would you say? Nomura From my impression at the time of reading the Uplift novels, the differences are in the treatment of intelligent life. I think in 40s SF the only intelligent life form representing Earth was humanity, and the only intelligences which cooperated with humanity were visitors from other worlds. Seeing the uplifted chimps and dolphins working alongside humanity (Streaker was even designed less for human than for dolphin use) felt very fresh to me. ttani That's a great point to watch. By the way, in the old space operas there were many aliens who couldn't be expected to develop scientific or industrial technologies because of the way the organs corresponding to hands and feet worked, but nevertheless had spaceships and weapons vastly superior to what the humans had. How does the Uplift series handle this sort of inconsistency? 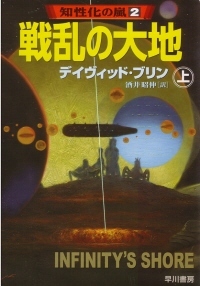 Sasabe The Uplift series has the Galactic Library as its trump card. :) Though just like Streaker, though modified for fins, was originally purchased from a used spaceship dealer, the other species probably also use several-million-year-old ships customized for their own use. Nomura Not only the Galactic Library, but the whole idea of uplifting and the way there are patron species and client species are excuses for that, right? Species with organs which make it difficult to develop technology, like [ttani] says, can still take over the patron species' technology through being uplifted and service to their patron. Could the client species inherit the access privileges of the Galactic Library from the patron race? ttani I noticed while reading that although many SF gadgets appear, there's no explanation of them whatsoever. We're only shown what they're like to use, the situation, and the result. For the most part I more or less understood them, but there are a few that I still have no clue about. ttani I still haven't decided if that's the style of this series or just the style of Brin himself. Sasabe I think it's the style of the series ? "Earth" had a lot of scientific explanation in it. Nomura Did dolphins start to be recognized as intelligent after the studies of John C. Lilly in the 60s? 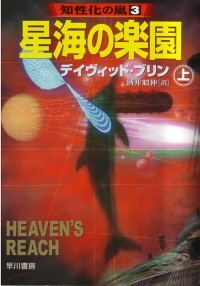 Some examples of science fiction affected by Lily are The Dolphins of Altair (Margaret St. Clair, 1967) and Larry Niven's Known Space series (1960~). I think that primates like chimpanzees had been around for quite a while, but even if they helped human beings they never shown as being much beyond pets. Or they have been treated like bizarre creatures that act in ways inexplicable to human standards in, say, horror stories in far-off places from the pulp magazines. Nomura I'd forgotten "Flipper." That's been a while! I remember watching reruns when I was a kid. I looked it up, and before the 1964-1968 TV series, there was a movie (1963), and that apparently contained a note of gratitude to John C. Lilly. So even if "Flipper" was the direct influence, you could say John C Lilly had an indirect influence (though that might be stretching it a bit). Sasabe I'm from the generation that grew up watching Flipper on TV. :) Hmm, Flipper was also produced by being illuminated by the study of John C Lily, huh? 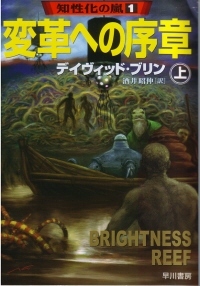 Nomura This is a digression concerning E. E. Smith, but "Samurai Lensman" by Hideyuki Furuhashi is a novel which could only be written in these days. It probably would have been impossible to write about a whale Lensman in the days of E. E. Smith. In other words the generation who grew up reading Smith are now writing SF. 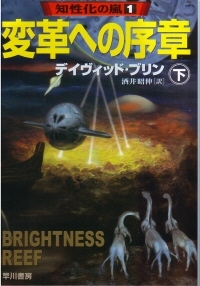 ttani Will the uplifted dolphins appear in "Brightness Reef"? It's really interesting. As Akinobu Sakai wrote in the afterword, because the people of Jijo intend to follow the Path of Redemption, humanity, who has no intention of aiming at the Path of Redemption, is in the position of leader contrary to the world of the Galactics. The other five species, especially the young generations, are affected by human culture a lot. Many are fascinated by human books (mathematics, philosophy, novels and so on). So it is no wonder if they, who are aliens originally, wind up acting human. Sasabe BTW in mixi (the largest Japanese social networking service) there is a David Brin community. I'd like to introduce some of the comments that we've gotten permission to quote. I'm relived that humanity isn't part of the uplift chain, which is like a galactic macho jock-type competition. If humanity were to be somebody's client species, I'd like it to be the Kanten or Linten. However I'm afraid we'll probably get added into one of the nasty ones like the Soro. We'll get all genetically fiddled-with into some form or another, wouldn't we? That's scary, scary. I'm losing track of what I want to say, so basically, the Uplift novels are interesting. Sasabe The Uplift Storm Trilogy didn't resolve everything, did it? Mimikurin Who are the fake patron-species Rothen anyway? My image of the Rothen is the guy who use supernatural power in the "Mutos-cyborg-series" of "Cyborg 009." I'm really apprehensive about the continuation of the uplift novels. * Cyborg 009 is a classic manga created by Shotaro Ishinomori. 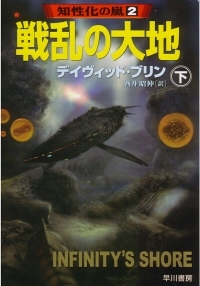 tneko I forget which book it was (Uplift War? ), but it really made an impression when a Thennanin said to a little aboriginal animal something like "Evolve yourself favorably." So I guess I could accept being incorporated as a client of the Thennanin. Their training is probably really strict though. "Ah, but they hate Earthlings." "No they might just hate children who were not trained well." Mimikurin The Thennanin might be good. They look like they've got lots of love for their clients. But if you make a mistake when you're separating the trash, you may get beat up. Qoomako Mimikurin, that made me laugh. I agree! Mimikurin I'd like to ask Mr. Brin what he'd want to check in the Library if he could access it. tneko I'd like to finish with a useless mumble about the Chocoball package being a reemergence of the memory of our former patron. "Kue!" * Chocoball is a Japanese chocolate candy (Morinaga & Company, Ltd). The bird Kyoro-chan is the Chocoball mascot. "Kue!" is Kyoro-chan's cry. Science Fiction Fan. A member of the Hard SF Laboratory. 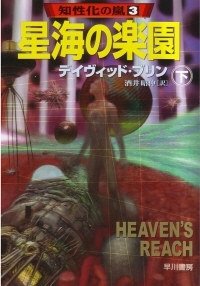 I love the study of literature like "literature of SF literature." Recently I'm interested in space exploration. The members of the mixi David Brin Community.